Syracuse, NY (November 12, 2013)-- From November 7th through the 10th, members of the EarQ team attended the 2013 Academy of Doctors of Audiology (ADA) Convention in Bonita Springs, FL. 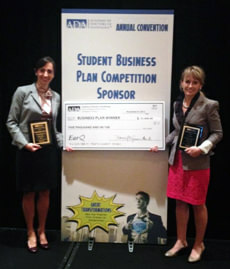 The team exhibited the company’s unique programs designed to better connect patients to practices, as well as supported private practice ownership by sponsoring the ADA Student Business Competition and presenting practice management tools. EarQ chose to sponsor the student business plan competition in order to promote future industry leaders. Andrew Hebert, EarQ's vice president, served as one of the judges. Alongside Hebert was a panel of industry professionals, including Keith Lewis, vice president of business development for ReSound. The business plans were judged on their creativity, feasibility, completeness, cohesiveness, professionalism and polish. The grand prize winner received a $5,000 ADA cash grant to be used to develop their business objectives and skills in order to strengthen their ability to help more people overcome hearing loss. To round out the event, Cliff Carey, EarQ's communications director, lead a discussion on exit strategies and succession plans on November 8th.